Craftin' Caro: VIDEO: Hearts Framelets Dies! Framelits Dies look very different from other dies in the Stampin' Up! product line, but the opportunities are endless when you use them in your craft projects. The innovative, thin, wafer-like design of the Heart Collection dies lets you see where you’re placing the design before you cut! Layer dies inside each other to cut frames for stamp images. 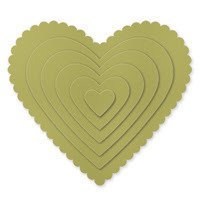 Cut single hearts for accents or layering and use them with single sheets of card stock or Designer Series Paper. The Hearts Collection coordinates with the Take it to Heart Stamp Set, with the largest heart being approximately 5-1/4" wide. The collection includes 6 dies in a sturdy envelope for easy storage in our Big Shot Die Storage.